Step out the backdoor of any Pine Ridge condo for sale and you'll find the ski run called Four O’clock Run, which is the way down from Breckenridge ski resort to Park Avenue in downtown Breckenridge. Pine Ridge Condominiums are just west of Park Avenue, a block up Four O’clock Road. Four O'clock Run is the last vestige of the early ski resort era - when nothing but open land separated the town from the mountain. 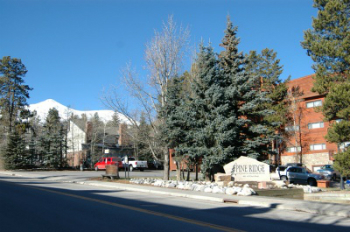 All Pine Ridge Condos for sale are ski-in via Four O’clock, and are only a quick walk from the shuttle that runs continuously through the day to all the peaks’ base areas. In the summer, Four O’clock run is a wide trail that leads to the national forest and activities on Peak 8. Park Avenue is the western main street of the commercial district of Breckenridge, and Pine Ridge Condos are less than two blocks from it. Keep reading about these great ski homes or follow below to see all available PineRidge Condos for sale. Sign Up to use our great search to find you perfect ski-in home. All of these three-story buildings got a facelift that moderized what was a '70s mining-ski-town, board and batten style. These buildings condo all have external stairs connecting the buildings and leading to the upper floors. They share a large parking area where all residents have available surface parking. These well established condo can generate long or short-term rental income because of their convenient location. Pine Ridge is a large complex, but doesn’t feel like one. They are several stories, but their design is elegant, rather than massive. The units are not small, and get good morning sun. In 2002, the exterior façade was updated, and the good news is that the financial assessment for this remodel has been retired. In addition to Four O’clock Run, several trails radiate in all direction from town, and make it easy to start a mountain bike or hiking excursion. Size: 1086 sq. ft to 1480 sq. ft. Amenities: on Four O’clock run, close to town, hot tubs, ground level parking, exterior remodel complete. From the Riverwalk Center in the heart of downtown Breckenridge, cross Park Avenue and head west on Four O’clock Road and climb gradually uphill for about a block. Pine Ridge will be on the right at 400 4 O’clock. The Riverwalk Center is 1.5 miles from the traffic circle on the northside of Breckenridge, along the main route, which is Park Avenue. 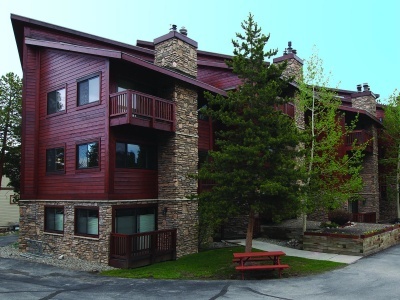 Are you searching for a ski-in/ski-out condominium in the Breckenridge area? We can talk to you about your opportunities in Pine Ridge, or many other Summit County communities. Email us today.